Is There Growing Optimism in US Economy? For the last few weeks, we’ve all been distracted with important issues. To name a few, completing tax returns, listening to the debate on guns, and following the news on the rising tensions in North Korea. If you think back, you may have missed a headline about the Dow Jones Industrial Average breaking its all-time high. That happened on March 5th, a little less than 2 months ago. It’s a worthy milestone to reach. But what does that mean for your investments or the future? Everyone has an opinion. When asked “What do you see happening next in the economy”, a well respected economist responded “If I had a crystal ball and knew the answer to that question, I wouldn’t be here. I’d be sitting on the beach.” Some look at this event and say that we’ve reached a high water mark and that we should expect to see the market decline. Others look at this and see it as an indication that the bull market is continuing along. Is the glass half empty or half full? Are you optimistic or pessimistic about the future? If you’re on the fence, not sure what to make of this recovery, the following link offers a great case for being optimistic about the future. We have been fully invested in this asset class since August. Trends have remained positive. The trend continues to remain flat for the most part, which we noted at the end of the 1st quarter. The only exception are some securities that invest in emerging market debt which have been flat for several months, resulting in the moving average catching up to the current price. The trend is not conclusive, but it is a sign that it could turn negative. One of our longest held positions continues to perform very well. This asset class has had a few bumps in an otherwise positive trend that has existed for a few years. Up until last week, many of the trends were flat to slightly negative. Then during last week, the price of gold and silver dropped. This had ramifications throughout the commodity market. Most of the securities we are tracking in this asset class are now below their average. Our positions at the time were minimal given most trends were already negative. Why Is It So Hard to Make a Tax Deductible Contribution to a Traditional IRA? Unfortunately, the answer isn’t a straightforward “yes” or “no”. Rather, we have to drill into each client’s specific situation to make sure we follow the in’s and out’s associated with IRA contributions on a case by case basis. 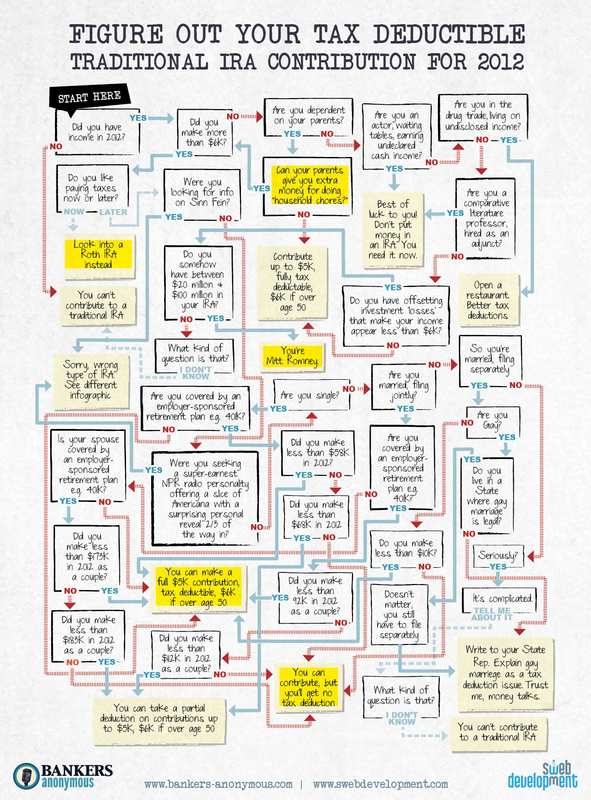 The below infographic does a pretty good job at capturing the complexity of answering the question. Bottom line, before making a contribution to your IRA, consult with a financial advisor or tax professional because it’s complicated. Are You Addicted to News? A recent article by the Guardian discusses 10 reasons why news can harm you. It’s an interesting read, one that reinforces a message that we regularly communicate to our clients: news is sensationalized to draw viewers but it should be taken with a grain of salt and not relied on to make investment decisions without doing your own research. The article references the sensational and shocking stories we see. These stories are designed to scare us into doing something (or not doing something). The article fails to recognize, that there is a lot of insightful, objective, and thoroughly-researched journalism produced every single day that readers should be reading. Length does not necessarily indicate quality. Long articles can be sensationalized just as much as a tweet. And a tweet can be more insightful than a long article. The problem becomes: How to determine quality news from an eye catching headline with regurgitated content. Second, where do we find quality news and who can we trust? We will cover those questions in a later post. The quarterly trend update has been released and can be accessed by following the link below. The PDF tracks the investment trends for several major asset classes, including U.S. equities, foreign equities, bonds, real estate, and commodities. A New Strategy. A New Approach. 1) Turn off the TV. 95% of what you hear and read about the economy is noise. A recent article on the front page of Yahoo.com reports that actress “Mila Kunis Rotates From Cash to Stocks”. We’re not putting the link there, because that’s the noise we’re talking about. 2) Put a multi-year plan together. Step 1 – Decide what the funds will be used for and when you expect to need them. Step 2 – Determine the amount of risk you need to take in order to reach your goals. If not, there are many strategies that can be used to help you. Maybe you need to save more, or maybe you need a new investment portfolio and investment strategies. 3) Stick to it. It’s important to remain committed to the plan, with periodic tweaks and changes. All to often, we see plans used for only a short period of time before old habits come back. 4) Get a second opinion. It’s important to remember to tap the expertise of a financial advisor when developing your plan. When prospective clients ask us for help, we dig deep to make sure all their investments and assets (including their 401(k), IRA, ROTH IRA, bank accounts) are working well together. We look at a few key areas for each portfolio: proper diversification, fees & expenses, performance, and volatility within the portfolio. Each of these is important and is driven by a client’s personal situation and risk tolerance. Most importantly, we look to see if this portfolio could achieve the client’s financial goal. There are a lot of options and factors to consider when preparing for retirement. It’s no longer just about the size of your nest egg. It’s about adequate insurance coverage, strategies to maximize your social security benefits (interesting story here), strategies to minimize taxes, and weighing your needs for Long Term Care insurance. And that’s just to name a few. For many investors, the bad news was cause for them to pull their money out, sit on the sidelines and wait for conditions to improve. They waited for the situation to turn around and to feel confident again in the markets. We all remember the infamous day of September 29, 2008 when the markets dropped so much. But the very next day, the markets had one of the best days ever. And for the past three years, the economy has been growing and growing. Many investors who stayed invested are back to where they were before the 2008 recession.